6-Pack Soy Tealight Candles + Gemstone! Please note: The stock we have may fluctuate in size and quality. Product colour and shape may vary, and not be exactly as shown. Our 6/Pack Soy Tealight Candles come with 1 Gemstone (inside an organza bag with its specific Info Card. Fragrance-Free. 6/Pack SOY TEALIGHTS +Amazonite Stone (single) / Stone comes with info card inside organza pouch. Graphic shown is for illustrative purposes only; size and shape may vary. SYMBOL: Amazonite filters out stress and soothes energies in the home and workplace. The most popular gemstone of the potassium aluminum silicates. Generally pale aqua, others in the same family range from clear and white to pale yellow. Recent studies suggest that its blue-green color results from small quantities of lead and water in the feldspar. Amazonite is used in jewellery and as an ingredient in ceramics. 6/Pack SOY TEALIGHTS + Aventurine Stone (single) / Stone comes with info card inside organza pouch. SYMBOL: Aventurine encourages creativity, gives courage and independence. Best for fear free thoughts. When we are not inhibited by fear we can create freely and attract what we truly deserve such as prosperity. 6/Pack SOY TEALIGHTS + Fluorite Stone (single) / Stone comes with info card inside organza pouch. SYMBOL: Fluorite heightens your intuition. It can help maintain an unbiased impartiality when making decisions by reducing one's emotional involvement in a situation. 6/Pack SOY TEALIGHTS + Goldstone Stone (single) / Stone comes with info card inside organza pouch. SYMBOL: Goldstone renews strength, balances energies and induces happy thoughts. Goldstone is manmade glass with flecks of copper suspended in it. Its invention occurred by accident in seventeenth-century Venice by the Miotti family. The glass is made in a reducing furnace with copper salts added, this smelts the copper salts back to copper, which then crystallizes. As a healing stone, it is the stone of ambition and drive and has a gently uplifting quality. The metaphysical properties of copper are said to be the ability to aid the circulatory system, help strengthen bones and fight arthritis pain. 6/Pack SOY TEALIGHTS + Gold Tiger-Eye Stone (single) / Stone comes with info card inside organza pouch. SYMBOL: Tiger Eye helps in keeping focus. Alertness and clarity are the keywords of Tiger Eye. It is a powerful stone, often used to attract and maintain wealth. Gold tigers eye is a gemstone in which crocidolite has been replaced by quartz, while its fibrous structure is preserved. The shimmering eye-like nature, called chatoyancy, is caused by these fibers. 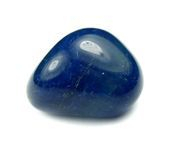 Found primarily in Africa and India, it is prized as a gemstone and often fashioned into jewellery. 6/Pack SOY TEALIGHTS +Lava Stone (single) / Stone comes with info card inside organza pouch. SYMBOL: Lava Stone, also known as Basalt, combines the elements of earth and fire to bring strength, energy, passion, self-restraint and common sense. Lava Stone aids healing by increasing vitality and feelings of joy. It brings stability, grounding and a feeling of connection to the earth. Volcanic residue has been transformed into attractive jewellery that appeals to both men and women. These stones have an irregular porous surface that is often scented with aromatherapy oils. Lava is molten rock generated by geothermal energy and expelled through fractures in planetary crust or in an eruption, usually at temperatures from 700 to 1,200 Celsius. The structures resulting from subsequent solidification and cooling are also described as lava. 6/Pack SOY TEALIGHTS + Onys,Black Stone (single) / Stone comes with info card inside organza pouch. 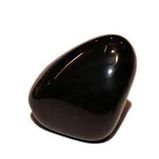 SYMBOL: Black onyx is believed to be one of the most powerful protection stones. Known to help in astral travel. 6/Pack SOY TEALIGHTS + Onyx, Blue Stone (single) / Stone comes with info card inside organza pouch. SYMBOL: Onyx helps to release negative emotions, sorrow, grief and it guards against negativity directed at you. Same attributes as Black Onyx. 6/Pack SOY TEALIGHTS + Opalite Stone (single) / Stone comes with info card inside organza pouch. SYMBOL: Opalite is a highly energetic stone. Good for meditation, it can also remove energy blokages, give us strenght and improve communication. But above all, it is mostly a healing stone. 6/Pack SOY TEALIGHTS + Rhodonite Stone (single) / Stone comes with info card inside organza pouch. SYMBOL: Rhodonite clears away emotional wounds and scars from the past. It eases doubts about personal abilities and helps in achieving one’s highest potential. Highly polished semi-precious stones that are smooth to the touch. Earth stones are easy to carry in pockets and bags and a great way to appreciate the natural beauty of gemstones. Ideal for collecting, gifting, or jewellery making. Great for a thoughtful little gift to share with both men and women. 6/Pack SOY TEALIGHTS +Rose Quartz Stone (single) / Stone comes with info card inside organza pouch. SYMBOL: Rose quartz is the love stone. It opens the heart, increases self acceptance and the ability to love others. 6/Pack SOY TEALIGHTS + Unakite Stone (single) / Stone comes with info card inside organza pouch. SYMBOL: Unakite stimulates the healing of the soul. It helps awakening the higher-self and getting rid of pent-up emotions. 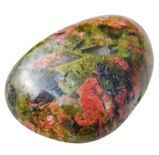 Unakite is also known to absorb the electromagnetic smog. Unakite is an altered granite composed of pink orthoclase feldspar, green epidote and colourless quartz. It is considered a semi-precious stone. As a healing stone, the colours are associated with healing the heart. Unakite is said to lift spirits - this is the gemstone to help one see the beauty in life. It is also used to uncover deception.